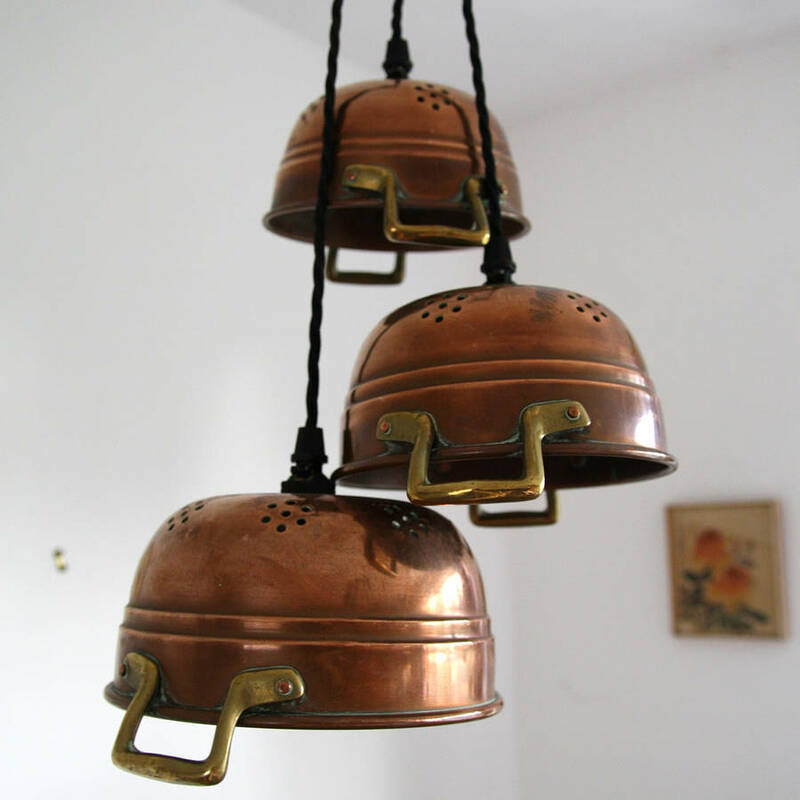 Very old - some antique - copper colanders and sieves repurposed into quirky pendant lamps. Copper lighting in bang on trend and these querky colanders lights have both character and style. 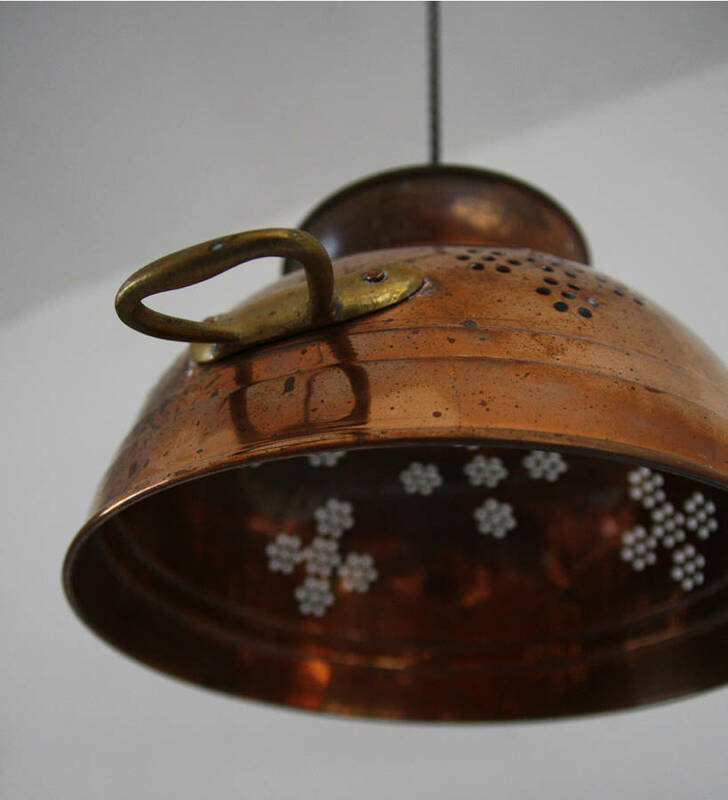 We only use genuine copper colanders that have a great patina and add tremendous warmth and a luxury feel. To be hung individually as discreet pendants or why not cluster together for impact. An ingenious example of recycling they make a super cute addition to a kitchen or dining space. 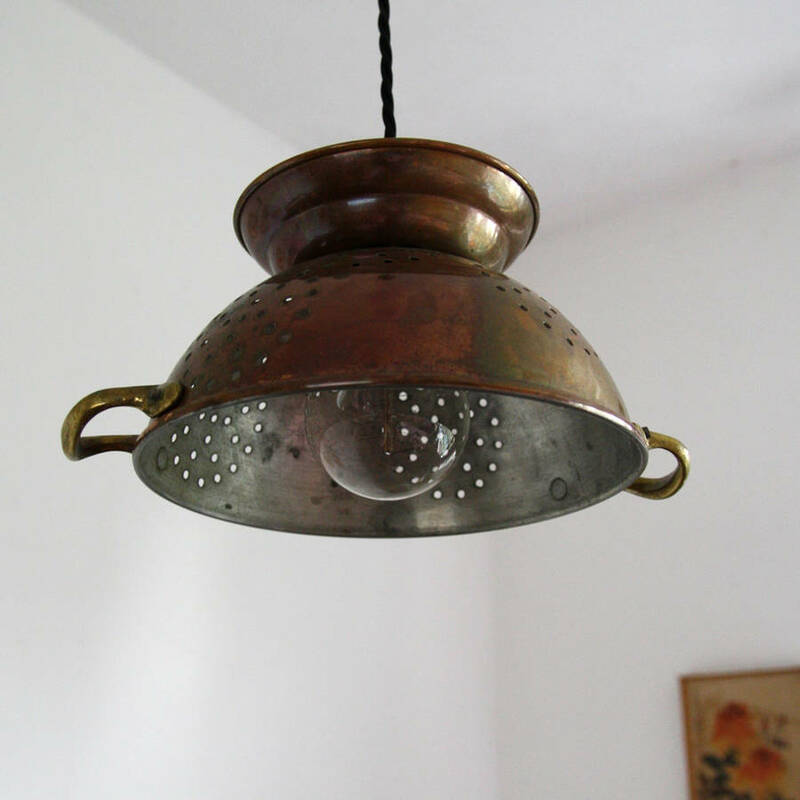 Design and sizes vary as every lampshade is a vintage original colander - some have legs, others have handles. If you'd prefer a particular style just check with us what's currently in stock. Fitted with a one metre length of black silk flex. The actual length used can be adjusted by your electrician on wiring in. Should you wish not to wire into a ceiling light point but hang from a ceiling hook and drape over to a wall socket be sure to check the length of flex required to your order and request a bakerlite plug. Our standard flex length for hook hung mains lights is 5 metres. To fit Edison Screw (ES or E27) light bulbs. 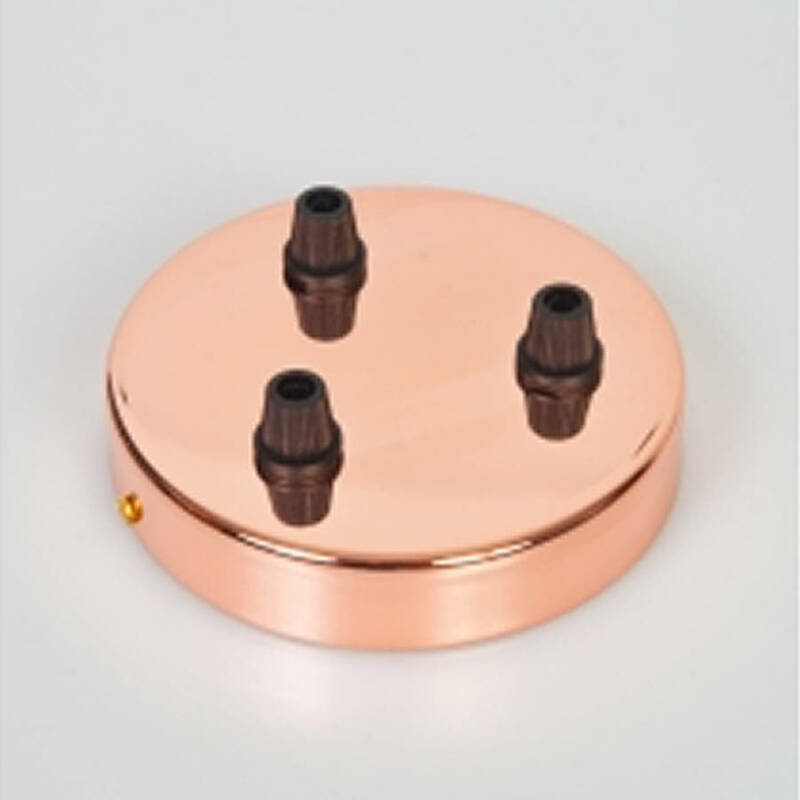 Available with or without a British made copper ceiling rose. Made from an original vintage aluminium jelly moulds mostly circa 1900-1950. 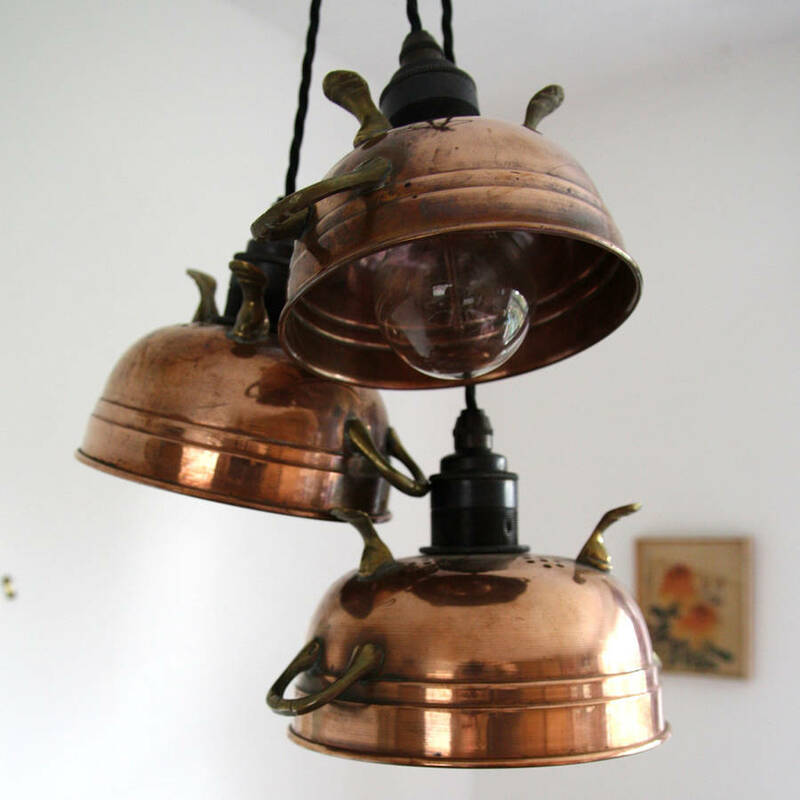 British made aged brass E27 bulb holder and shade rings. Each unique lampshade mould varies in size between 15cm-25cm width. If you require a larger light repurposed from vintage kitchenalia please see our vintage cake mould lights - or for a smaller version our mini-mould lights. One metre length of black silk flex cord on ceiling wired options. Five metres of flex on hook hung and mains plugged option. This product is dispatched to you by Folly & Glee.